Adding a well-built conservatory into your home is said to increase the value of your property but a considerable 21%. Hence, it is especially important to maintain and preserve the condition of your conservatory and its appearance. Leaving your conservatory to deteriorate will only cost you more, in the long run, to have it replaced. There are a few simple maintenance tasks you could perform sporadically in order to secure the quality of your conservatory. In addition, windows also require regular upkeep to ensure they are weatherproof all year round and resistant to harsh conditions. Windows play a huge role in the appearance of your home, both the interior and exterior, so it is important to ensure they are well kept. Here is our advice on how to clean windows and your conservatories by hand, without the assistance of a professional. It is advised to thoroughly clean your windows at least twice a year. This means ensuring the internal glass, external glass and window frames have been washed and polished effectively. The main duty of a window is to provide a transparent barrier to allow light into your home and offer you a good view of the outdoors. However, windows cannot properly perform their job role if they aren’t clean. There is the option of hiring a professional window cleaner to save yourself from having to do the job, but why not save yourself the unnecessary cost and do it yourself. 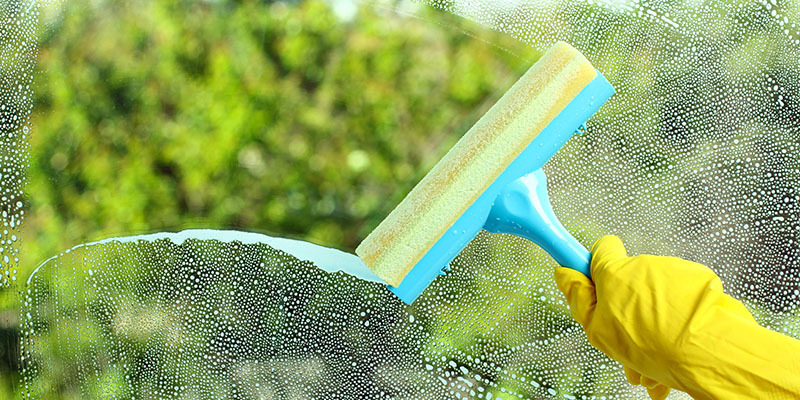 If you are confident in your abilities to meticulously clean the windows in your home by hand, then it will be useful to know as much information as possible before you start. Before you start, there are several items you will need to make sure you have on hand. To wash your windows to a professional standard, here is what you need to purchase (or find within your house). First of all, you will need to take the dry brush and remove all evidence of cobwebs or other debris from around the frames and window ledges. You will then need to take your bucket of warm water and add in the window cleaning solution or fairy liquid. Fairy liquid is a satisfactory substitute if you don’t have window cleaning solution. However, if you really want to achieve the professional finish, then we suggest investing in a bottle of actual window cleaning solution. The combination of the warm water and soap effectively breaks down any grease on the surface of the windows. To apply the warm soapy water, use a non-abrasive sponge and ensure the entirety of the panes are covered. You can then continue by removing the excess water using the squeegee. To eliminate any build-up of grime, make sure to periodically wipe the blade of a clean, old cloth. Remove the remaining water with the microfibre cloth by making your way up from the bottom to the top of the window frames. If your windows are made from uPVC, then make sure to open the windows are apply the warm soapy water solution to the inside of the frames. You can then leave the windows open ajar to allow them to drive. If you do not have any fairy liquid soap or window cleaning solution at home, then you can always use a more organic and environmentally friendly alternative; vinegar. To make up the vinegar solution, mix one part vinegar to one part warm water and apply it in just the same way you would do with the soap. Nevertheless, it is important you avoid applying this vinegar solution during a sunny day. It is recommended to clean your windows with vinegar on a day where there is little direct sunlight. This will avoid any chemical reactions while your windows dry naturally. If once you have finished, and you find streaks on the glass, you can pour the vinegar solution into a spray bottle and apply directly to the affected areas. You then need to leave the solution on for half an hour before you can wipe off using a clean sponge. If you perform this process when cleaning your windows, then you are guaranteed to be left with crystal clear glass and polished window frames. In the same way that you started the window cleaning process, you need to remove all debris from the roof of your conservatory. This includes general grime, mould and leaves. For those who have a low-strength power washer at home, use this to remove any tough algae and moss. However, do not use the power washer on the glass as this will cause it to shatter. Furthermore, investing in a telescopic cleaning brush will make your job a whole lot easier; providing you with better vision and eliminates the need for a ladder. Once you have removed all evidence of debris from the conservatory roof, you can then apply a warm soapy solution. It is best to work methodically, working your way from one side of the roof to the other. It may be necessary to apply generous amounts of soap if there is the presence of stubborn dirt. Nevertheless, it is imperative that you do not resort to using anything abrasive to remove tough stains. this will mark and permanent scratch the roof of your conservatory that could be noticeable from inside. Once you are satisfied with the result of your clean roof, you can then rinse off the soap using a standard hosepipe and then leave to dry in the sun naturally. In order to successfully retain the condition of your windows and conservatory roof, you must make sure to regularly clean both. This will help to eliminate the quick deterioration of your window frames and conservatory roof, ensuring they provide you with a long service life. If, however, you feel that your conservatory roof is beyond the point of repair, then why not invest in conservatory roof replacement in Milton Keynes. For a reliable supplier and installer of conservatories, get in touch with us today.